LAS VEGAS, NV – Justin Rumford was twice as happy as the rest of the winners at the PRCA’s annual awards banquet after winning the 2018 Coors Man in the Can award and the Clown of the Year award at the National Finals Rodeo in Las Vegas, NV this past December. The 38-year-old entertainer, who will be in the arena for PRCA Rodeo Rapid City performances during the Black Hills Stock Show, has won Clown of the Year every year since 2012, making this his seventh in a row. He also won the Coors Man in the Can award in 2013 and 2015. Rumford is no stranger to the big stage, having worked the Wrangler National Finals Rodeo in 2014 and serving as an alternate in 2012 and 2013. He brings his own brand of comedy to the rodeo arena with nods to his favorite comedic actors, such as Kevin James and the legendary Chris Farley. Raised in the family rodeo stock contracting business that was started by his Grandpa Floyd in Abbyville, KS, he spent his college days bull fighting, riding saddle broncs and steer wrestling. When it all came to an end due to a knee injury, he decided to try his hand at being a rodeo clown. It turns out that providing his style of comedy for rodeo fans, while putting his years of bullfighting to use as a barrelman was just the change he was looking for. “I just got in the right situation when the guy didn’t show up, so I was put in at the Greensburg, KS., rodeo and it’s been one of the biggest blessings of my life,” Rumford said. Fondly called the “Rumpshaker” by cowboys, rodeo personnel and fans alike, Rumford’s admirers stretch across the country as he’s hit rodeos from Florida to Arizona and in the Northwest. 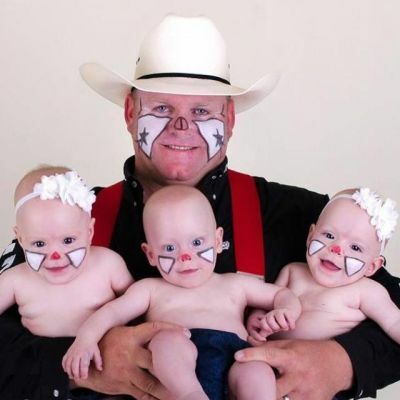 But his biggest fans are right at home in Ponca City, OK.; his wife, Ashley, and their triplets Livi, Lola and Bandy. Now Justin and Ashley travel the country together with their children in their toy hauler trailer. They love touring the rodeo towns they visit, meeting new friends, saving lives in some cases, and making people laugh.